Richard Pedranti Architect (RPA), a full service architecture firm focused on energy efficient design, announced that its first Passive House, built in Scranton, PA, was recently certified by the Passive House Institute US (PHIUS). In order to become a certified Passive House, RPA needed to design the home to PHIUS’ rigorous energy standards. RPA’s detailed design drawings of the home were featured at PHIUS’ NAPH15 conference in September as a clear and concise example of Passive House design. A Passive House is the most stringent building energy standard in the world, and uses 80% less energy than conventional homes. A Passive House creates a virtually air-tight, super insulated, compact building envelope that uses the sun and internal gains to achieve space conditioning, and in that way provides both comfort and exceptional energy conservation. Superior indoor air quality is provided by a heat recovery ventilator (HRV). With the addition of small renewable energy systems, Passive House buildings are able to achieve a Zero Energy Building (ZEB) standard. 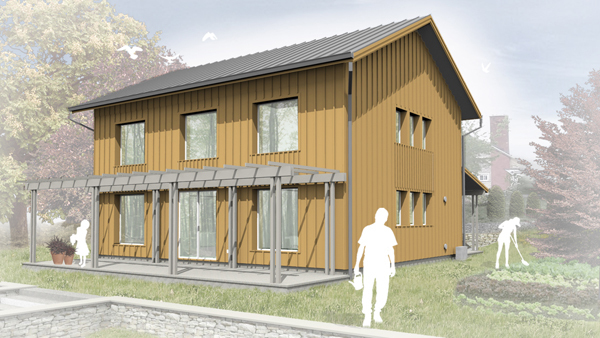 The Scranton Passive House is one of a 112 PHIUS-certified buildings in North America. PHIUS is recommended by the Department of Energy as the next step in high-performance and passive building standards. PHIUS is committed to making high-performance passive building principals the mainstream best-building practice, and the mainstream market energy performance standard.